Advent begins the end of this month and is a great time to pause and ponder all that God has given us. Is Your Advent Full with Stuff in your Hands or a Heart Stuffed with Joy? 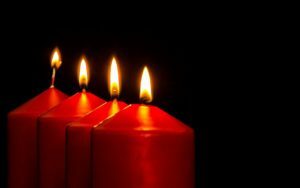 My gift to you this week is 10 inspirational quotes about Advent that I haven’t shared before here on Healthy Spirituality. Take one into your prayer, journaling, and time with God. May the words bless your Advent season. “Here’s an Advent illustration for kids — and those of us who used to be kids and remember what it was like. Suppose you and your mom get separated in the grocery store, and you start to get scared and panic and don’t know which way to go, and you run to the end of an aisle, and just before you start to cry, you see a shadow on the floor at the end of the aisle that looks just like your mom. It makes you really happy and you feel hope. But which is better? The happiness of seeing the shadow, or having your mom step around the corner and it’s really her? “Advent is the perfect time to clear and prepare the Way. Advent is a winter training camp for those who desire peace. By reflection and prayer, by reading and meditation, we can make our hearts a place where a blessing of peace would desire to abide and where the birth of the Prince of Peace might take place. You could more easily catch a hurricane in a shrimp net that you can understand the wild, relentless, passionate, uncompromising, pursuing the love of God made present in the manger. Don’t forget to download your free Advent Resource Guide here. In 2014 I wrote an Advent devotional that has reflections and quotes. It’s called Let Every Heart Prepare Him Room and available on Amazon. Christmas Crossroads – 30 Devotionals for the Holiday Season is now available on Amazon as an e-book and a print book. Christmas Crossroads – 30 Devotionals for the Holiday Season will enrich your time before Christmas, prepare your heart for celebrating the birth of Christ, and lead you to a clearer understanding of discernment in the crossroads of life. The crazy chaos of the holiday season descends upon our souls quickly, complicating our journey. We crave the peace, joy, and hope during Advent, but often we only experience uproar and mayhem. The intersection of uncertain choices merged with the holidays compounds our decisions. Approach Christmas with an open and receiving heart. Explore making the best choices at the crossroads encounter in life. Listen to people of the Bible and gather inspiration and guidance from their crossroad experience. Apply new ways to make the right decisions on our life journey. Grow closer to God in quiet reflections as you seek God’s guidance during the holidays. For the next several weeks, the e-book version is only 99 cents. Perfect daily readings for the Advent season. May daily devotions bless your life and bring you closer to God. I would be honored to walk with you during Advent. And if you would have time, leave a review on Amazon too – that is always a blessing for an author. Thank you!! Which of these quotes touched your heart?